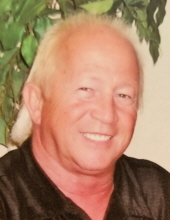 Gregory A. Fisher, age 66, of Centerville, IN passed away Tuesday, January 22, 2019 at the Rosebud Village Care Center in Richmond, IN. He was born March 7, 1952 in Dayton, OH to the late Charles E. and Betty Lou Fisher. Greg retired as an Outside Salesman after 26 years of employment with Motion Industries. He enjoyed bowling, golfing and playing softball; was an avid Ohio State Buckeyes fan; and he loved spending time with his granddaughters. He is survived by his sons Troy (Marie) Fisher of Williamsburg, IN and Taylor Fisher (friend Amy Vance) of Centerville, OH; granddaughters Fallon, Kayla and Brooklyn Fisher of Williamsburg, IN; brother Ed (Shirley) Fisher of West Alexandria, OH; sister Joyce (Curt) Garber of Arcanum, OH; former spouse Connie Fisher Sanders of Carmel, IN; and several nieces, nephews and numerous other family members and friends. Visitation will be held on Sunday, January 27, 2019 from 9:00 am to 12:00 noon, with funeral service to follow at 12:30 pm all at the Prices Creek Old German Baptist Brethren Church, three miles south of Eldorado, OH on State Route 726. Burial will follow at the church cemetery. Girton Schmidt & Boucher Gard Funeral Home, Eaton is assisting with arrangements. Online condolences may be sent to the family by visiting www.gsbfuneralhome.com. To send flowers or a remembrance gift to the family of Gregory A. Fisher, please visit our Tribute Store. "Email Address" would like to share the life celebration of Gregory A. Fisher. Click on the "link" to go to share a favorite memory or leave a condolence message for the family.